Have you already written a will but decided you want to make amends? A codicil acts as an add-on to any existing will, without the need for a new will. Discover the pros and cons of codicils and when it’s best to write a new will. This post explains the concept of codicils, why they are used to amend wills and their limitations. A codicil is a legal document that is separate to your will. It contains subsequent minor additions or amendments to your will. You need to have an existing will to write a codicil to it. Legally a codicil can be used to alter anything in an existing will, but it is not established good practice to alter your main assets (e.g. property) by codicil. Therefore, if you wish to alter large assets, which comprise a significant proportion of your estate (10% or more), then it would be advisable to make a new will rather than a codicil. What are the risks involved of using a codicil? The biggest risk of any codicil is it being a separate document to your will. If a codicil is not stored with your will, or your executors aren’t aware you prepared one, then it might be lost or ignored and the unaltered terms of your will carried out instead. That’s why codicils are only recommended for less significant gifts. If you can easily update your will, (Farewill offers unlimited updates for £10 a year), it’s better to have a single document that is up-to-date. Bear in mind: Solicitors preparing codicils often charge, costs vary between £30 to £70 per small amend. What if you already have a codicil? Primarily, make sure it is stored alongside your will. It’s good practice to inform your executors that you have chosen them and where they should look for your will when you die. If you do make a codicil, you should also let your executors know, so that they’ll know to look for a codicil too. As we grow older, things change. Whether it’s big or small, we don’t want you to be tied down by the will you write today. 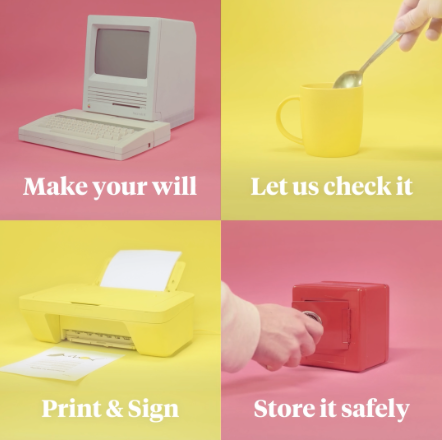 If you make an online will in just 15 minutes with Farewill and take annual membership (£10 a year) you can make unlimited changes to your will. Our specialists will review your details and approve your will before it’s sent back to you for signing. Want to know more about what makes Farewill work? Unlike other online will makers, Farewill offers live support to help you through each step, 7 days a week, 9am-7pm. Unlike other lawyers and will-writers, we only charge £90 for a will - that’s an average saving of more than £110.